I’ve wanted to add this to the blog for a while now and finally got around to it. I’ve always believed in high intensity low volume workout routines for hard gainers like myself. I didn’t start to really grow until I read the book Super Squats, and then after that found other routines like that to help me grow. The first time I watched the Blood and Guts video was years and years ago and I really didn’t understand what I was seeing. It looked great and intense but it wasn’t until I read the book “Blood and Guts” that I finally understood what he was accomplishing in the video. 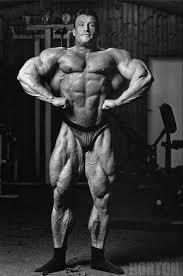 then I recommend finding Dorian Yates on YouTube HERE- https://www.youtube.com/channel/UC7XOcTLP1aw3kR6q3-WyYbA and checking his videos out for yourself on his channel. The idea is maximum intensity, Low Volume, Low rep ranges, all-out effort. When doing this routine remember to always do some light weight sets before you start with any given body part. For example, when I’m doing this routine, and say I’m working chest, I’ll do 4 to 5 sets on the incline to get hot before I even begin the 4 sets and 1 working set of the first exercise. This is not all out effort, this is just a wake up. Below is the routine used in the Blood and Guts video. Also included below is the Blood and Guts 6 week Trainer video.